During times of war, it is difficult to find a surplus of Army recruits who want to serve their country, unless they are highly motivated. 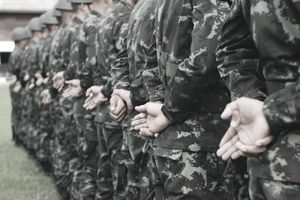 Finding recruits that want training and job skills for their future is more difficult when fighting a war overseas is an almost definite path during their military stint. The government has many programs to help entice people to join, and they all involve money or tuition assistance of some sort if they decide to enlist in the Army. During the height of the Wars in Iraq and Afghanistan, from 2006-2009, the Army expanded its Referral Bonus program to include civilian employees, making it possible for them to earn $2,000 while helping the Army boost enlistments. It is no longer a program as the net result of $40 million paid as bonus yielded 24,000 future soldier's names. Doing the math, the program cost the Army a little over $1600 per soldier who joined through the Referral Bonus program. The recruiting incentive - known as the "$2K Referral Bonus" program for the regular Army and Army Reserve, and "Every Soldier is a Recruiter" in the National Guard - applied only to Soldiers and Army retirees who referred applicants who enlist, complete basic training and graduate from advanced individual training. The bonus for referring a prospective applicant who has never served in the armed forces originated in January 2006 as part of the 2006 National Defense Authorization Act, with a $1,000 bonus. It was doubled to $2,000 in November 2006. The now defunct program ended in 2009. There were people who gamed the system pocketing as much as $4 million in referral bonuses. Soldier must be a member of the regular component of the Army, The Army National Guard (SELRES) or Army Reserve (SELRES) to include AGR Soldiers on active duty; Future Soldiers in the Future Soldier Training Program (FSTP) (USAREC Only) or Army Retirees which includes: (1) Active Army Retirees, which includes retired officers and enlisted members of the Regular Army; and (2) Army Reserve Component Retirees, which includes Reserve members receiving retired pay, Reserve members who have transferred to the Retired Reserve after completing the requisite qualifying years credible for retired pay, but who have not yet reached 60 years of age, and retired members of the National Guard. Additionally, Soldiers performing duty in the Hometown Recruiter Assistance Program (HRAP), Special Recruiter Assistance Program (SRAP), and Active Duty for Special Work (ADSW) or in the Future Soldier Training Program (FSTP) (USAREC Only). Effective 5 December 2006, all contracted (Scholarship, Non-Scholarship or ROTC/SMP) Army ROTC Cadets are eligible to participate in the Referral Bonus Pilot Program. In March 2006, the Referral Bonus Pilot Program was expanded to include Soldiers performing duty in the Hometown Recruiter Assistance Program, Special Recruiter Assistance Program, as well as in the Active Duty Special Work program. Effective 15 March 2007, Army civilian employees were even eligible to participate. Those not eligible to receive a referral bonus include Soldiers and civilians assigned to the U.S. Army Accessions Command, U.S. Army Recruiting Command, Cadet Command, U.S. Army Reserve Command – Retention and Transition Division, National Guard State Recruiting Commands and any other member of the Army serving in a recruiting or retention assignment. Anyone was also ineligible for the bonus if their duties could be perceived as creating a conflict of interest, as determined by the secretary of the Army. Soldiers and civilian employees identified above were ineligible to receive a referral bonus for three months following a reassignment outside their recruiting and retention duties. Soldiers and Army civilian employees received the bonus for referring anyone, except a member of their immediate family. An immediate family member is defined as spouse, parent (including step-parent), child (natural, adopted, or step-child), brother, or sister. Additionally, the applicant must not have previously served in the U.S. Military, and must not yet have met with an Army recruiter. The first $1,000 of the bonus were paid to the referring individual when the new Soldier is in basic training. The remaining bonus is paid in a lump sum once the qualified applicant completes Basic and Advanced Individual Training, known as AIT. There are no retroactive provisions to this pilot program. Payments will be made directly to the referring Soldier/Civilian employee's pay account within 45 days after the person that was referred completes AIT. The referral was made via the following Web sites and calling the Army or National Guard's toll-free numbers. Once again, this program no longer exists.